Ashley Taborsky didn’t grow up with chickens. But the more she learned about the food industry’s treatment of animals, the more control she wanted over her food. She educated herself through classes at Alaska Mill & Feed and the University of Fairbanks Cooperative Extension, along with extensive research online, then bought some chicks to raise in her Anchorage backyard. Five years later Ashley has a flock of nine and blogs about her experience at Alaska Urban Hippie (alaskaurbanhippie.com). The page has links to articles on selecting, brooding and rearing chicks. Ashley’s not alone. In the State’s fiscal year 2017, 1,230 Alaskans imported more than 91,000 poultry, six and one-half times more than the number of birds brought in just three years earlier, according to data provided by Alaska State Veterinarian Robert F. Gerlach. There’s no denying those fluffy, chirping baby chicks are cute, and raising chickens has its rewards. But just like any other pet, there’s some things to know before you plunge into life as an urban chicken farmer. The first thing every potential chicken owner should do is review city ordinances to ensure you don’t run afoul of any zoning restrictions. Depending on where you live, there may be limits on the number and types of birds you can own, setback requirements for enclosures, and restrictions on the types of properties where chickens are allowed. Anchorage homeowners, for example, are allowed no more than five birds per 6,000 square feet of property, plus one more for each additional 1,000 square feet; roosters, turkeys, guinea fowl, peacocks or geese are prohibited on property smaller than 40,000 square feet. Homeowners’ associations may impose additional restrictions – including prohibiting them entirely – so make sure to check your association’s bylaws. As far as livestock goes, chickens are a relatively cheap investment. 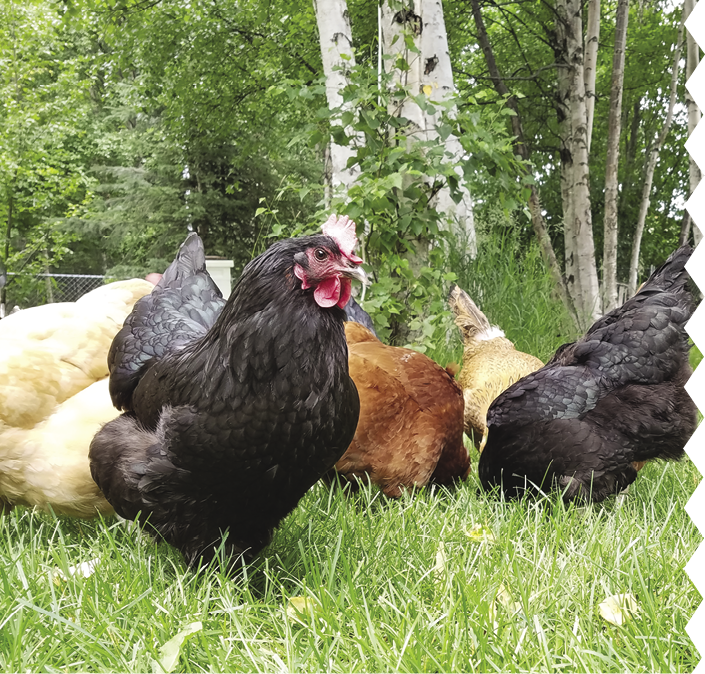 “Chickens are the cheapest farm animal you can raise on every front, from food to cost of the birds to maintenance,” says Stephen C. Brown, extension agent with the University of Fairbanks Cooperative Extension and dean of “Chicken University,” a series of courses on chicken ownership he teaches through the extension program. Chicks can cost anywhere from $3 to $5 per bird, with egg-laying hens running from $20 to $30. 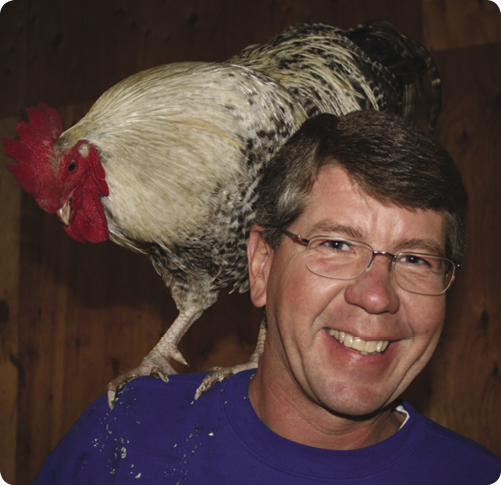 Alex Davis, owner of A.D. Farm in Palmer, began raising chickens seven years ago so he could sell eggs at the farmers’ market; he currently has 100 adult chickens, in addition to an ever-changing number of chicks. “Housing is the biggest upfront cost, then it’s the feed bill,” he says. Alex helps keep feed costs down by buying in bulk from a local source in Delta Junction. Feeding them kitchen scraps can further defray feed costs, Ashley says. As far as the chicken coop, the general rule of thumb is to allow three square feet of space per bird, which helps them keep warm during the colder months, especially if the coop is unheated, Stephen says. But chickens are surprisingly adaptable, he adds, and heating the coop isn’t necessary if it's properly insulated and the birds are slowly acclimated to Alaska’s colder climate. Chickens are also surprisingly self-sufficient, Ashley says, which helps if you head out of town frequently. Ashley was initially worried that her brood would limit weekend excursions, but soon found that with a bit of pre-planning – and the installation of a gravity feeder – she can leave for several days without worry. Danni Hall, who has seven chickens at her lower Anchorage Hillside home, agrees, and jokingly says chickens are “idiot-proof.” The hardest part, she says, was keeping their water from freezing in winter, but a heater designed for that exact purpose solved that problem. Chickens won’t save you money at the grocery store – the cost to feed and house your backyard flock means you’ll pay more overall for the “free” eggs and meat they provide – but for most chicken owners, the primary motivation is access to fresh eggs and knowing where their food comes from, Stephen says. “If you’ve ever had a home-raised chicken egg, you can never go back to store-bought because they are so much tastier,” he explains. It’s the reason Danni and her family, who are on their second flock, decided to raise them. For those who butcher the hens once they’re past their egg-laying prime (usually five to seven years), the lack of hormones and antibiotics makes a difference too, both in terms of knowing what’s going into their bodies, and the taste of the bird itself. “You can’t buy a bird that tastes this good at the grocery store,” Alex says. Despite the positives, chickens do come with their share of challenges, including some uniquely Alaskan ones. One is the sheer amount of poop. “A lot of keeping chickens is poop management,” Ashley says with a laugh. Like Stephen, Ashley uses it for fertilizer; if that’s not an option, she says, you’ll need to take into consideration how frequently you’ll clean out the coop. Predators are another concern, though it’s not just the proverbial fox in the hen house that owners need to worry about. To protect against predators, keep the pen covered – Alex uses fishing net to keep birds of prey out – or only let them run free when you’re close by, Stephen says. And then there’s your neighbors. Chickens make noise, and unless you plan on keeping them indoors, your neighbors will hear them. Stephen encourages prospective owners to reach out to their neighbors beforehand to avoid potential problems. Whether raising chickens for eggs, meat, as a family pet, or a combination, Ashley encourages people to do their research.